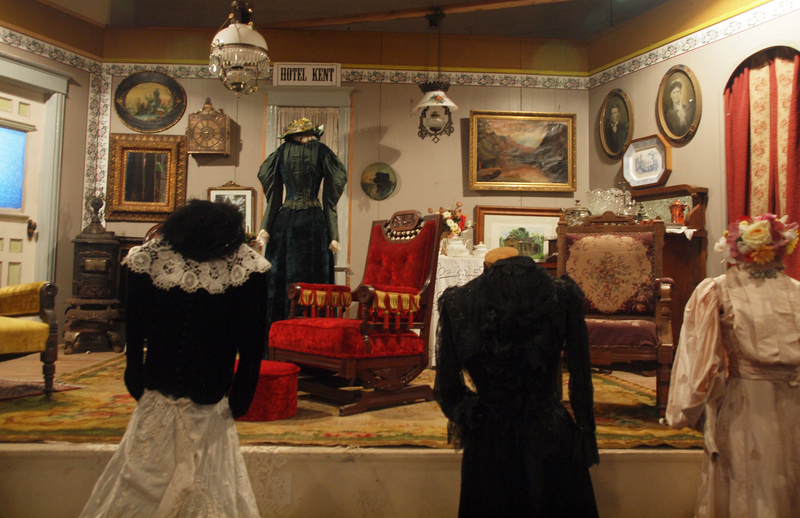 On the stage of the museum is a display of an old parlor. 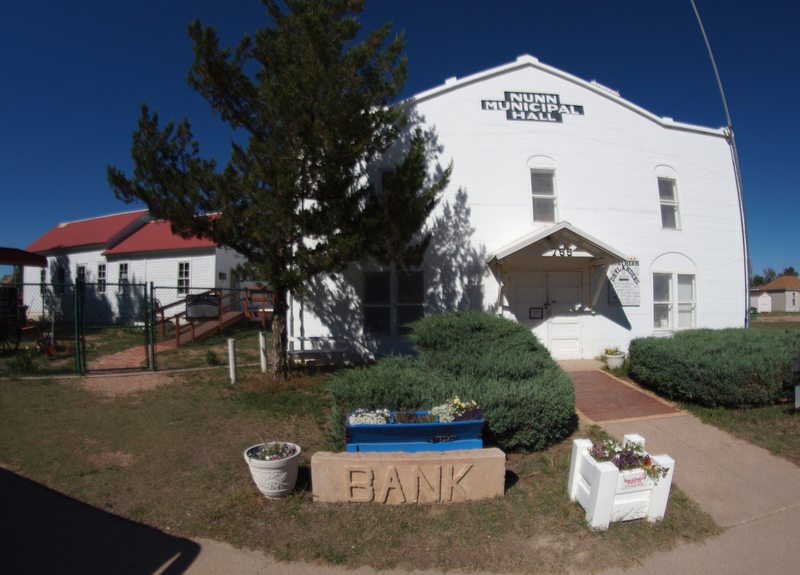 If you have any interest in the local history of Northern Colorado, you must visit the Northern Drylanders Museum in Nunn, about a 45-minute drive east of Fort Collins. 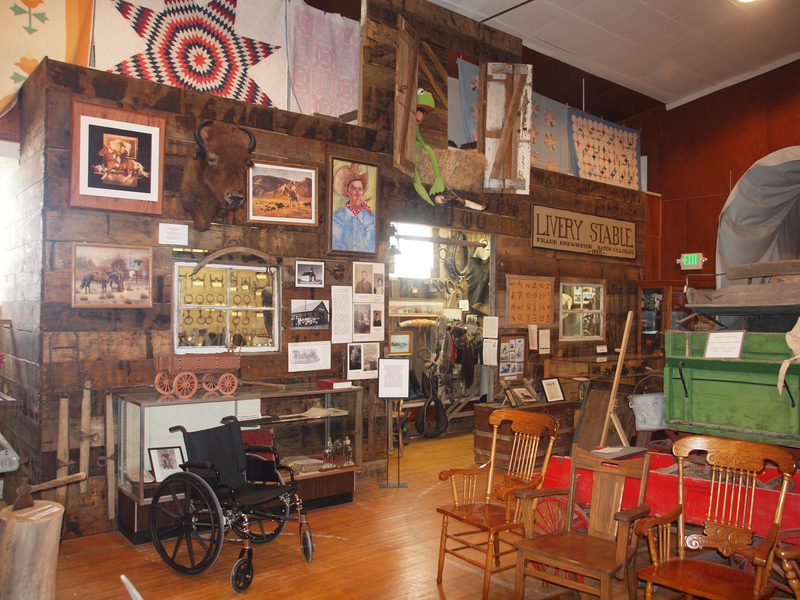 The museum is a treasure trove of fascinating, beautiful exhibits and artifacts of historical life on the High Plains. Volunteer guide Dale Barnaby is a longtime resident of Nunn. As a boy, he played school basketball on this floor that now holds a trove of local historical treasures. On my visit to the museum, I was met by volunteer guide Dale Barnaby, a longtime local resident who graduated from Nunn High School in 1944. Mr. Barnaby is a gracious host with a quick wit and an easy smile, and encyclopedic knowledge of local history, which he clearly enjoys sharing. 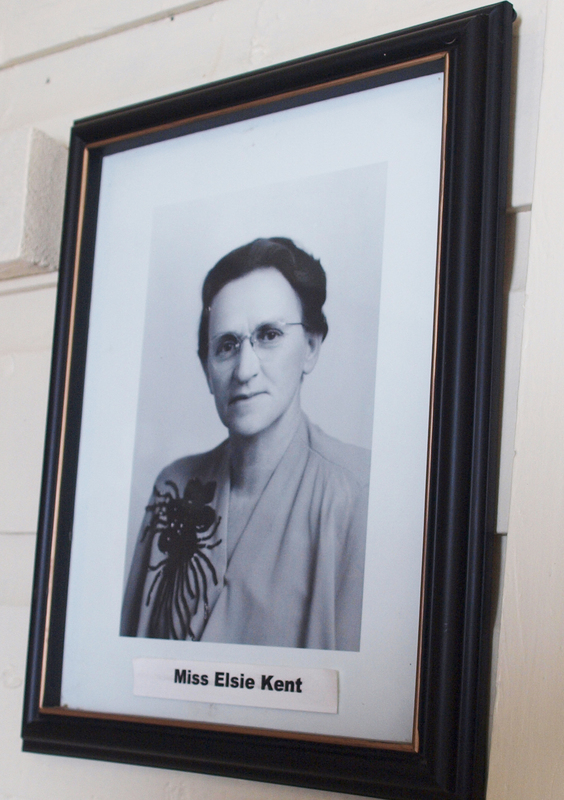 The museum opened in 2000 and is operated by the High Plains Historical Society. It has received funding from several sources, including the Colorado Historical Fund and private individual donations. The main building is the former municipal hall, built in 1934 as a New Deal project. In his boyhood, Mr. Barnaby played school basketball in the multi-purpose hall. At the far end is a stage, where theatrical plays were performed and other events were conducted. The stage now serves as a display of a historical parlor, complete with period furniture and mannequins modeling gorgeous dresses. 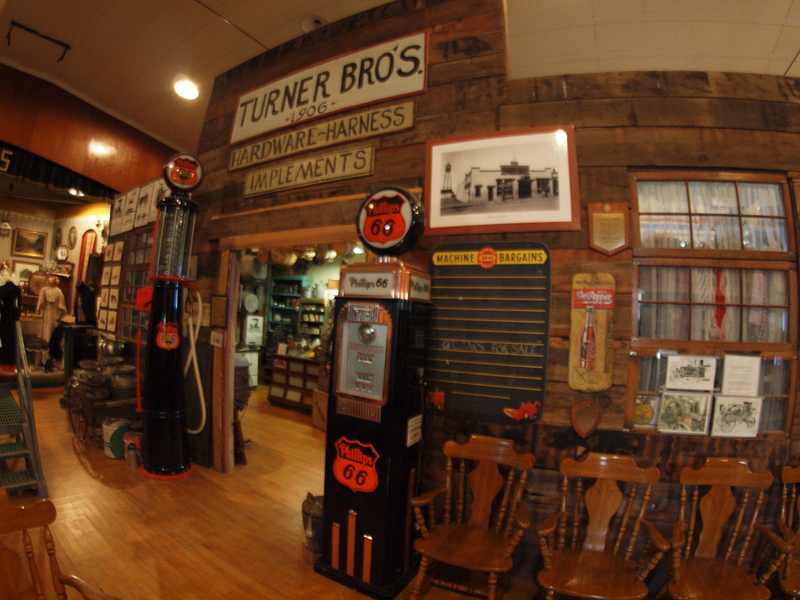 The former Turner Bros. store has been re-created inside the museum and stocked with original fixture and merchandise. My first step into the hall was awe-inspiring. It’s so chock full of items on display – left and right, up and down, near and far – that at first the eye can’t decide where to start. But the exhibits are quite artfully conceived, and by someone skilled in principles of design. This is a museum of big-city quality but with authentic small-town character and charm. Occupying the center of the hall, among many other items, is a covered wagon from the pioneer days. Around the outer areas are several vignette exhibits. One is a reconstructed local store that was known as Turner Bros., jam-packed with items that had been in the store, including a vintage cash register and a magnificent array of original merchandise. Mr. Barnaby informs me that all of the merchandise is vintage except for the contents of one big jar on the counter, which is freshly stocked with new candy that visitors are welcome to enjoy. 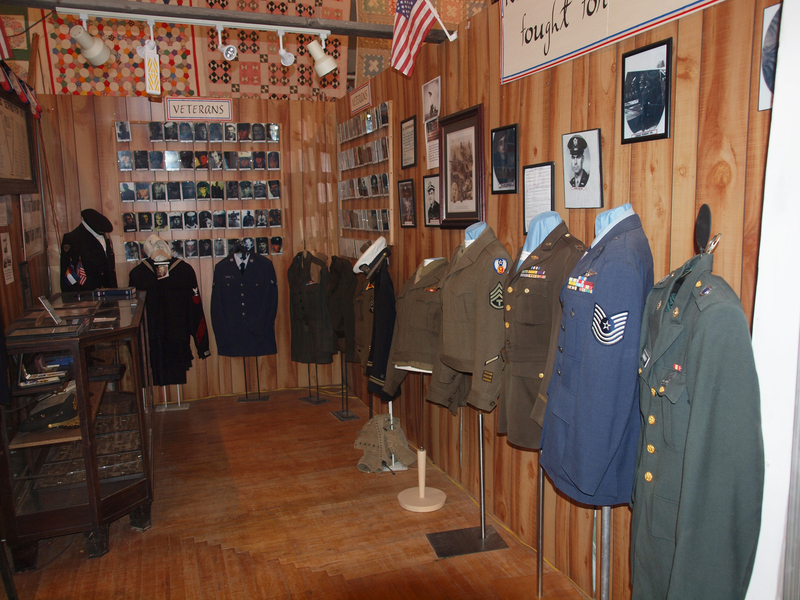 The actual military uniforms of several local men who served in World War II. World War II veterans are honored with a display of actual uniforms that had been worn by local men. Mr. Barnaby speaks fondly of these boyhood friends, some of whom did not return from the war. He himself was unable to join them in service because the military had classified him as 4F. 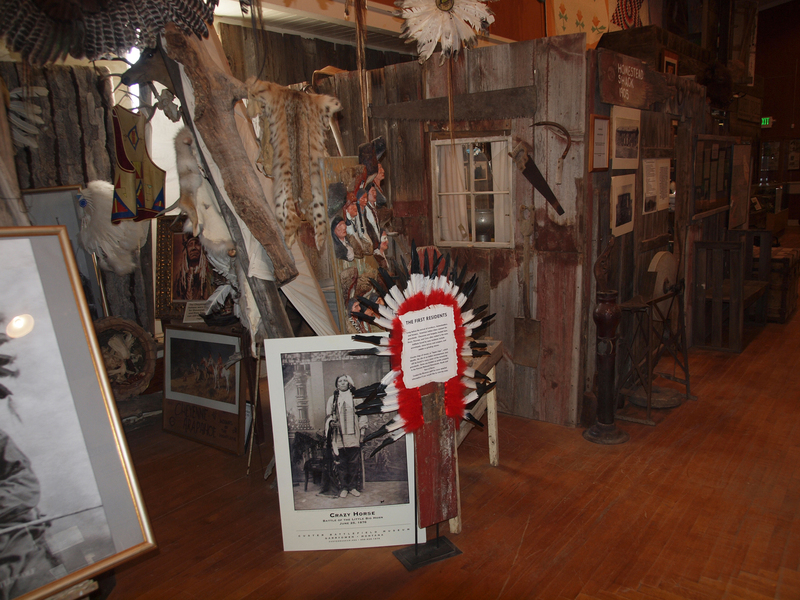 Native Americans, too, are well-remembered at the Drylanders Museum. One whole corner of the hall is dedicated to their history, including a full-size teepee that you can step into and get a closer look at the many artifacts inside. Native Americans are prominently included in this collection of High Plains history. Adjacent to the hall is the Prairie View School, built in 1907, closed in 1949, and moved to its current location as a museum addition in 2007. As you step inside, there is a foyer with a vintage clothes rack, upon which hang several uniforms of the Nunn High School sports teams, known as the Nunn Terrors. Mr. Barnaby happily confirms that he was a Terror back in the day. The classroom is set up as it would have been many decades ago, with all the desks and blackboards, and even a mannequin playing the role of teacher. The community occasionally conducts special events in this room. A mannequin dressed for the part plays the role of teacher in the old schoolhouse. He recounts one particular incident that he got in trouble for. The class was studying the word “mushroom” and the children were assigned to use the word in a sentence. The first child said, “I ate mushrooms for breakfast.” The second child said, “I ate mushrooms for lunch.” Then it was Dale’s turn to use “mushroom” in a sentence, and this was his mischievous offering: “I have nine brothers and sisters, so when we all get in the car together, I don’t have mush room.” Miss Kent was not amused. 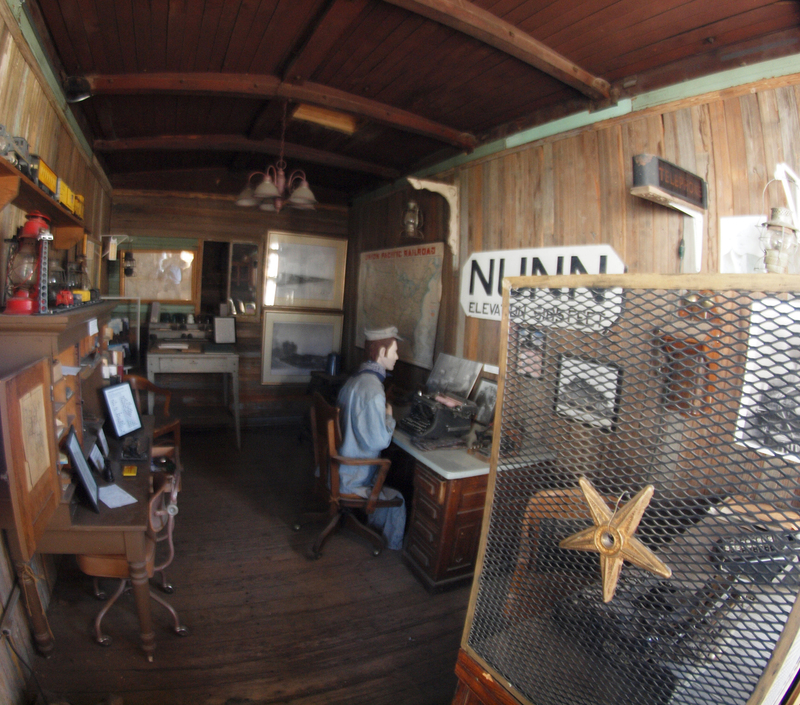 Next on the tour is a wood-sided railroad car, loaded with a tastefully arranged collection of historical items and a mannequin seated at a desk, working away on an old typewriter. But this is not just an indoor museum. In the yard outside is a collection of old farm equipment, a Model A Ford, horse-drawn wagons, and much more. 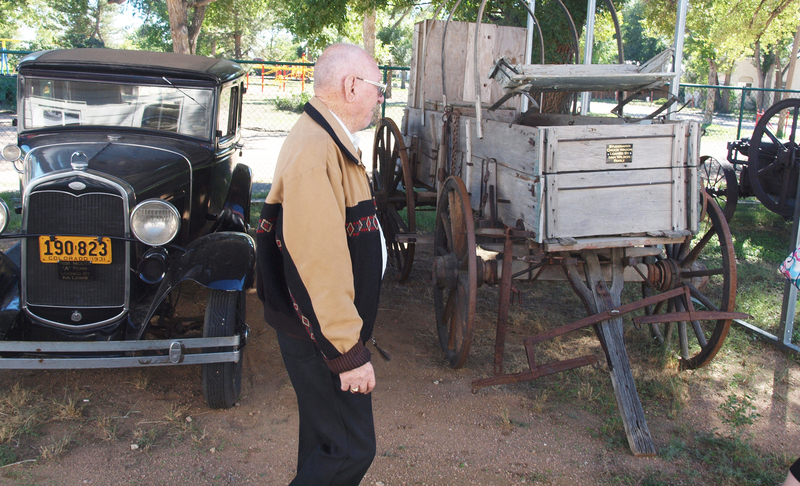 Mr. Barnaby demonstrates how an old threshing machine worked. From the age of about 13 to 19, he used a machine just like it, working 10 to 12 hours a day for a couple of months out of the year. 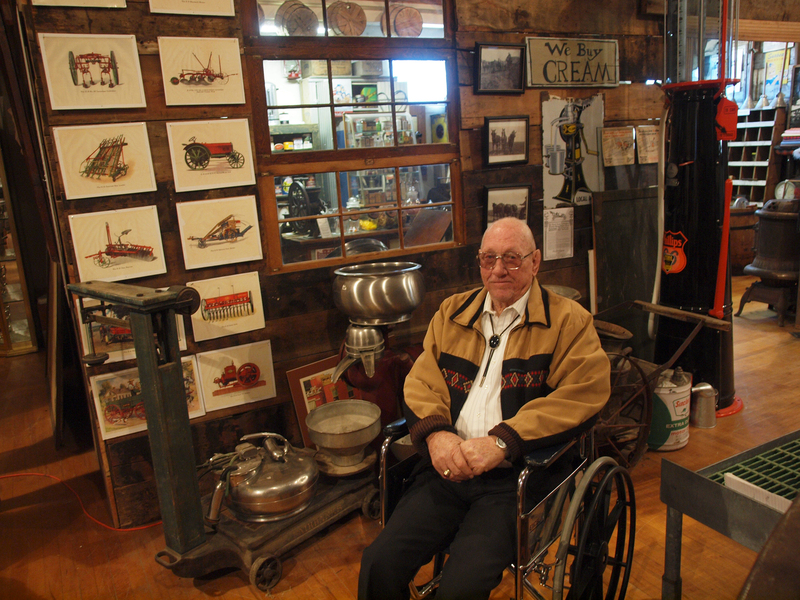 Dale Barnaby picks out the next item to discuss at the Drylanders Museum. At the blacksmith shop, Mr. Barnaby stops to demonstrate the story of when his brother Ed was injured in their dad’s shop. Ed had been hammering at the anvil, and something flew back and hit him in the face, leaving him with only one eye. “But the Army took him anyway. They took him, but they wouldn’t take me!” Mr. Barnaby says with a chuckle. About this time, I notice something is tickling my ankle. I look down and see that fire ants are swarming on me. The tickle suddenly turns to pain as they start crawling into my sock and biting. I could either drop my notebook and brush the ants off, or finish writing down something Mr. Barnaby has just said before I forget it. I decide the ants and the pain will need to wait their turn. Near the end of the tour, I was saddened to learn that Mr. Barnaby’s wife of 67 years, Mrs. Kahla Barnaby, had passed away just a few days before, and that services for her had been conducted on the very morning of the day I visited. So I felt all the more honored that even in this time of grief, Mr. Barnaby still took the time to show me around, and I sensed that it was comforting for him to go through the museum and its abundance of memories. As we pass back through the foyer of the hall, he points out a photo of a parade many decades ago. There’s a little wagon in the photo, and inside the wagon was a 3-year-old girl, the future Mrs. Barnaby. Mr. Barnaby explains the mechanics of the town’s original horse-drawn fire apparatus. His dad made the town’s first motorized fire engine, shown at the top left. Just inside the front door on the way out is a display of photos and documents depicting the history of the local fire department. Mr. Barnaby points out a picture of the first firetruck, which his father made for the town. Before that, all they had was a water tank on a horse-drawn wagon. Mr. Barnaby explains the technical operation of the horse-drawn water tank, how a small separate tank of acid was used to create a reaction that propelled water from the hose. The shed that housed that wagon is still standing, attached to the back of the hall. CONCLUSION: I thoroughly enjoyed my visit to the Northern Drylanders Museum. This is a first-class museum off the beaten path. It is eminently worthy of more recognition, more visitors, and more funding. It’s not a huge place, but you could easily spend a full day there and still not see everything there is to see. VISITING: The museum is at 755 Third St. in Nunn. From Fort Collins, take Highway 14 (Mulberry Street) east to the town of Ault, then turn north on U.S. 85 to Nunn. Third Street is on the left, across from Nunn’s historical landmark water tower. It’s a little less than 45 minutes from Old Town, Fort Collins. It’s open on Saturdays and Sundays from 11 a.m. to 4 p.m. or by appointment. The Historical Society says the museum is open “until October,” and I’m not certain whether that means it will be open at all during October. In any case, it would be wise to call ahead to verify whether the museum is open and to inquire about scheduling a tour, as it is staffed by volunteers. Contact numbers are Dale Barnaby at 970-897-2330 or 970-897-3064, or the high Plains Historical Society at 307-630-1221. Also, the society’s website has a contact page. END NOTES: If you’re looking for a place to stop for authentic local chow along the way between Fort Collins and Nunn, I recommend the Bison Breath Saloon in Ault. I opted for the burger and beer special, which, though upgraded from a Bud to a Fat Tire, was still only $6.95 plus tax and tip, and that includes delicious homemade French fries, along with good conversation. The Bison Breath’s biggest claim to fame is that it is one of very few restaurants in Colorado where smoking is allowed, through a quirk in the state’s anti-smoking law. 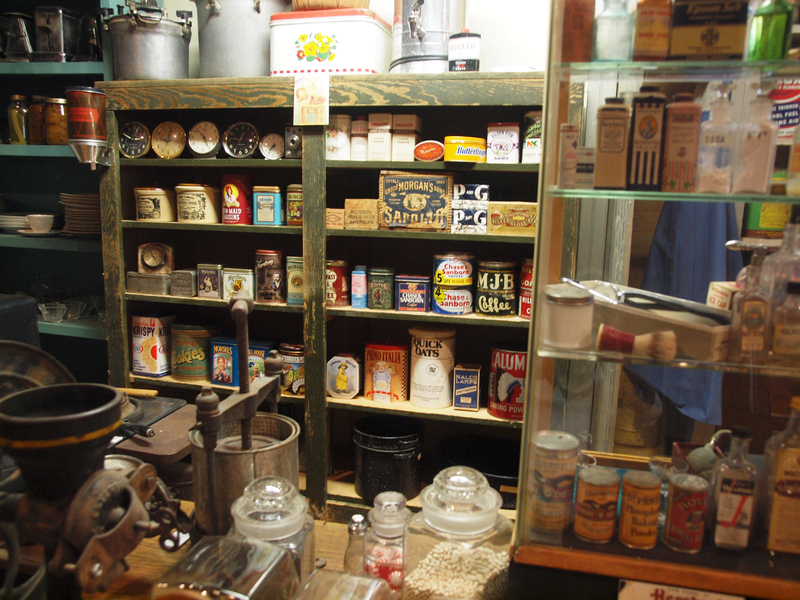 A peek behind the counter at Turner Bros. store inside the Drylander Museum. The exterior of the Northern Drylanders Museum in Nunn. The schoolhouse is at left. A long view inside the museum’s main hall. Inside the vintage wood-sided railroad car. 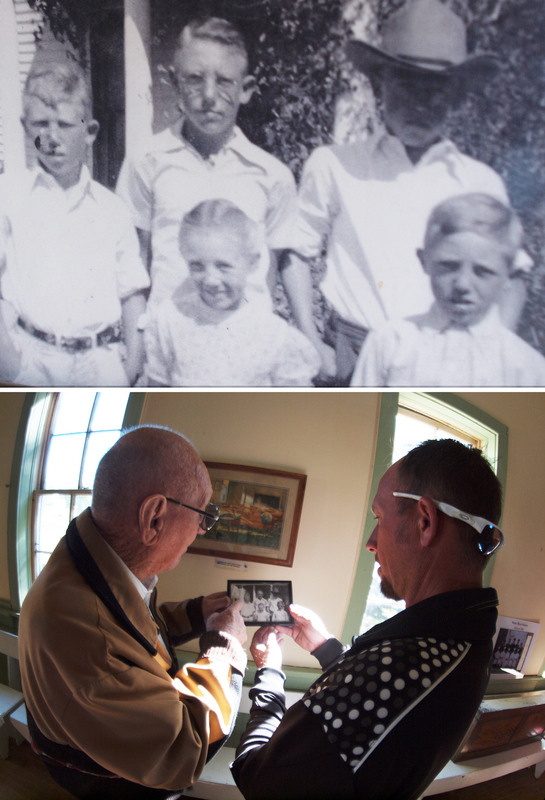 A framed photo that usually sits on the window sill in the old schoolhouse shows Dale Barnaby with four of his nine brothers and sisters. 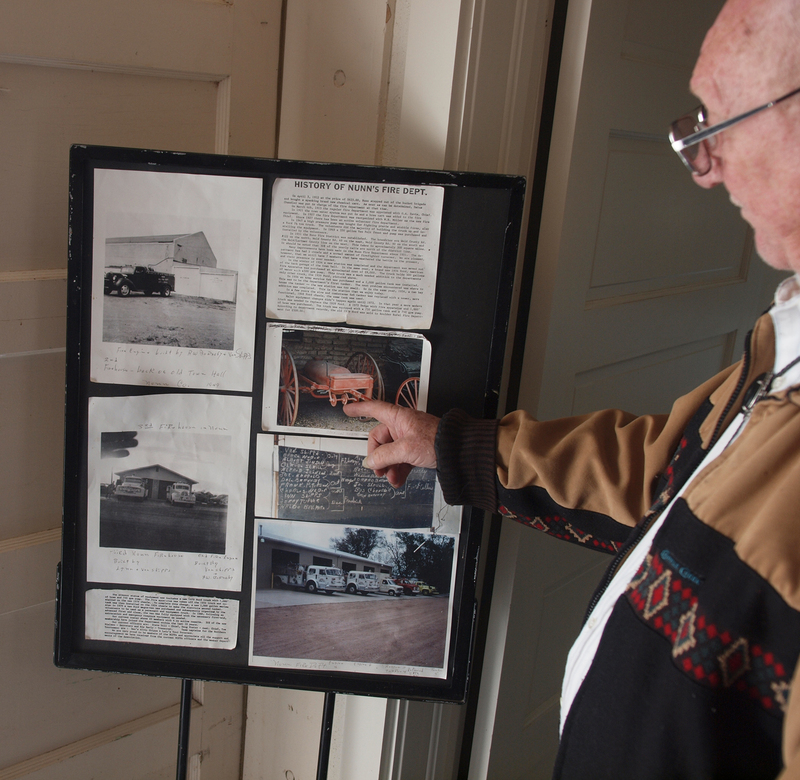 Here, discussing the photo with his grandson, Mr. Barnaby points himself out in the photo. He’s the boy in the middle of the back row. It was such a pleasure to meet you and thank you for going and visiting. Dale takes great pride in his town and the Museum. Thank you, Kim. I was pleased to meet all of you. It was a real treat to be led on a tour of the museum by Dale.